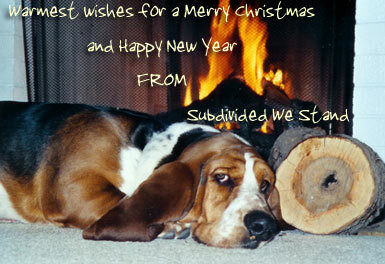 Subdivided We Stand will be on hiatus until Monday, January 3. If something doesn't happen in Mary Worth soon, I'm gonna....why, I'm gonna....uhhh....well, do nothing. No matter how glacial the pace, I'm hooked on Mare. In other news, I had the occasion to venture into a K-Mart this evening. The place reeked of failed retail concept and stale circus peanuts. Every now and then, I like to nip over to Brighton Hot Dog for lunch. They make a decent dog there -- not as good as The Original, mind you, but a respectable dog nonetheless. They also serve up some good fries, although again, they pale next to those of the Dirty O. Normally, I'd probably have lunch at Brighton maybe once every three months or so. But since September, I've been making one trip per month -- not so much for the food, but for the fabulous collectors cups. 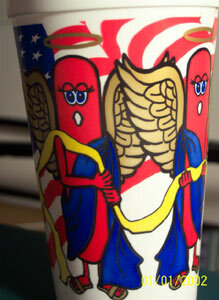 Every month, Brighton Hot Dog releases a new collector cup -- featuring notable tv characters done up in hot dog form. So far, I have Rocky & Bullwinkle, The Addam's Family, The Dukes of Hazzard, and the Mission Impossible team, all drawn as weiners. Each and every one is mildly obscene, and surreal in its weirdness. At some point, I'll post pictures of my entire collection. What I like the best about this month's cup is the skillful way they've managed to combine religion, jingoistic Americanism, and weiners. Behold, we bring thee tidings of great joy! For unto you is born this day a really tasty treat, which shalt combine the discarded scraps of pig and cow, along with linoleum and whatever else we find lying around, and put it into a bun, onto which thou mayest slather either saurkraut, or chili -- but not both. I didn't photograph the more...shall we say...risque angel dogs. Several of the lovelies have robes that display a little too much in the chest area, if you know what I'm saying. I imagine that Rumsfeld would demand that they cover those babies up. Our tablets are only equal usual lozenges but they are specially developed to be supple and soluble below the clapper. The lozenges is sorbed at the mouth and gets in the bloodstream directly alternatively of acting through the stomach. This results in a faster much more strong event which still up to 46 hours! should undergo an addition in intimate desire, a betterment in your size and execution, also as increased power and pleasure during intimate action. Ah hah! A salmagundi of weeds to better my execution. Won't the Mrs. be pleased? That last sentence is exactly the kind of crap I spewed out when I wrote the copy for one iteration of the Digital Greenhouse Web site. Honestly, I would've liked to have written some concrete information about what the Greenhouse did -- but beyond "leverage new paradigms" and that sort of happy horseshit, there was no "there" there. I believe that Web site won a bunch of awards, from others involved in the industry of obfuscation. But the b.s. on the Digital Greenhouse site was NOTHING compared to the whoppers I fabricated for a Pennsylvania economic development initiative called "Lightning Manufacturing." One of my first assignments at said agency was to write the copy for a Web site about a new Pennsylvania economic development initiative, to be called "Lightning Manufacturing." Fair enough. I was given some background documents, most of which described the partners behind the initiative, and some vague descriptions of the desired outcome. What was MISSING, however, was any description of what "Lightning Manufacturing" actually was. 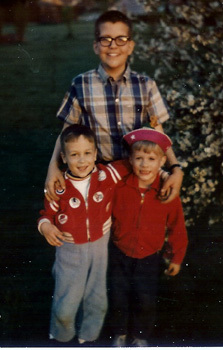 Nobody could explain it, nobody had a clue what it was about -- and I had to write copy for the Web site. Eventually, I gave up trying to figure out what the damn thing was, and just wrote some crap and sent it off to the client. My thinking was that by sending them copy for approval, they'd have to come back with revisions that actually contained some specifics. No way they'd let my little wisps of b.s. actually go out and represent a Commonwealth of PA economic development initiative -- would they? Those of you who've worked with government agencies probably already know the answer. They switched a couple of "ands" to "buts," and added a few more instances of the word "leverage," and greenlighted the whole mess. I had fabricated PA economic development policy out of thin air. The kicker was when we Web-cast Governor Ridge's press conference to announce the initiative. About 30 seconds into his speech, it started to all sound very familiar. He couldn't be. Could he? Oh yes, my friends. There was our governor, later to be charged with the protection of us all -- there he was, reading my idiotic drivel, pretty much word for word. It figures -- between the PG article about the Pittsburgh Bloggers Web site, and a couple of shout-outs from a couple of different blogs, I had record traffic yesterday. And what topic greeted those new readers? Ah well. I'm always finding new ways to shoot myself in the foot. But here's something I think you'll REALLy like. Bead Babe Designs. Original beaded jewelry by none other than Mrs. Subdivided. Enjoy! Yet another cold has crept in. Our house is afflicted with the plague, I'm afraid. This time, the prominent feature is nasal drainage, resulting in a nose that ran like a faucet when I was lying on my back last night -- or, when I flipped over, all that gunk ran into my throat and made me cough like the bejeebers. Finally got to sleep around 2 am, I think. At 4, I heard the hound whining downstairs. That's the "I need to go out" whine, but sometimes when you ignore it for a minute he gives up and goes back to sleep. On occasion, he keeps up the whining until there's no choice but to go let him out. This was one of those nights. As soon as I got downstairs, I knew something wasn't right. Both mutts wanted out, so I ignored the gnawing sense that bigger issues were ahead, hitched them up and out we went. Smithers clearly was having some booty trouble. He was in the arch, but no results. Upon returning inside, I found out why. The hound had had results, all right -- all over the dining room. In 43 (yes, I counted) different spots on the dining room floor. It took me 45 minutes to clean the mess, and by that time, I was too awake to fall back asleep. Aaargh. He Knows if You're The Son of God, So Be Good For Goodness Sake! The gospels vary somewhat in their accounts of the birth of Jesus. Mark and John, in fact, skip right over the nativity story and dig right in around the time of Jesus' baptism by John the Baptist. 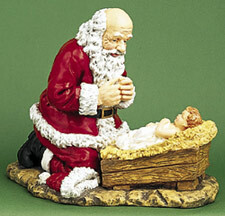 Yup, Santa was there, apparently -- at least according to one particular dealer in religious statuary. I'm assuming that he left the elves and reindeer outside the stable. I'm looking forward to this organization's Easter statuary offerings, which I can only imagine will feature the Easter Bunny crying at the foot of the cross. 'Tis the season where, unfortunately, many of us are at our most UN-jolly. Listen to Billy Holliday. This, actually, is one of the better suggestions. Because we all love Billy Holliday. Especially...ummm...that song she sings. Or the other one. You know which one I mean. Billie Holliday music is like War and Peace -- we all like to pretend that we have intimate knowledge of what they're all about, but nobody's ever heard the former and nobody's ever read the latter. Take up photography to learn about light. Brilliant. Or, I suppose, you could take up carpentry to learn about nails. Or take up dog ownership to learn about picking up crap in green plastic Post-Gazette bags. Fun! Hang a beach picture by your desk. Ok, I guess I can see where this one could provide a momentary, fleeting escape from the opressive darkness and gloom that is setting in around your downtrodden soul. Rent one of the Bob Hope/Bing Crosby "Road" movies. And then ponder for a few minutes about how people in the 40's thought this crap was hilarious, and then consider how people will likely respond to Jim Carey or Adam Sandler movies in 2036. Paint a room in your house yellow and bring in some tropical plants. Because God knows there's nothing that'll set your spirits soaring like spending a couple of hours painting a room -- especially in the middle of winter, when it's too cold to open a window for proper ventillation. Mmmmm -- breathe deep the gathering gloom! Go outside at night and toast the fall constellations with flutes of champagne. Buy some art supplies and learn to draw clouds and bare trees. Get up early and enjoy the quiet before dawn. Yes, there's nothing I like better when I'm down in the dumps than settin' the ol' alarm clock and dragging myself out of the rack a few hours earlier than I have to. Sleep deprivation is the key to inner peace...the Hare Krishnas and Moonies know this, the guards at Abu Ghraib know this, and now you know it too. So that's it -- the Knight-Ridder/Post-Gazette cure for Seasonal Affective Disorder. Cheer up, you grumpy Gusses! Think about this conversation. The dude on the other end is saying that he hasn't been back since he left. Try to think of one instance in your life for which that statement isn't true. For example, I haven't been back to my desk since I left work this afternoon. I haven't been back to my bed since I woke up this morning. I haven't been back to the word that began this paragraph since I typed it. I can't think of any way that it's physically possible to have been back to a location since you left it. And then, in panel two, we learn that the place where Dr. Whoosis hasn't been back to is still the same, but different. Just like them. What's she saying here? She's still the same ol' naive girl she was when they last were together, but now she likes to dress up in Hefty cinch-sacks, smoke a big ol' pipeful o' crack, and play endless rounds of strip "Candyland" with the friendly midget who lives in apartment 3C. See -- Plus ca change, plus c'est la meme chose.